Roadway and rail tunnels, by their very design are subject to a constant presence of moisture, even in relatively dry climates. This leads to a number of problems such as corrosion of embedded reinforcement, voids between the liner and base material, and water flow through and behind the liner, which sometimes appears in locations remote to the water source. 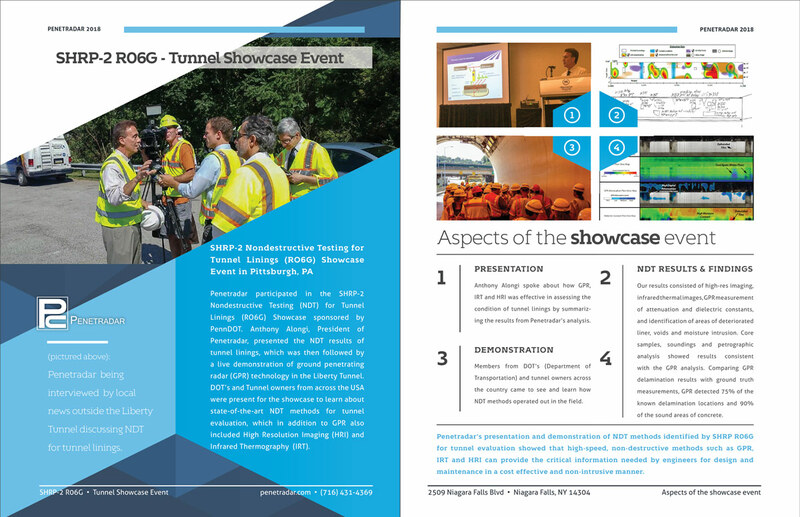 Penetradar has developed a multi-sensor, non-destructive testing (NDT) system in accordance with SHRP RO6G, that combines ground penetrating radar (GPR), infrared thermography (IRT) and high resolution imaging (HRI) technologies to detect and identify many types of tunnel liner defects before safety concerns are elevated. The system is entirely mobile, deployed quickly, and the process is performed rapidly, thus, avoiding prolonged tunnel closures, and most importantly ensuring safety. This system, which is the first, if not only, commercial system of its kind, produces comprehensive and quantitative information on tunnel liner condition. 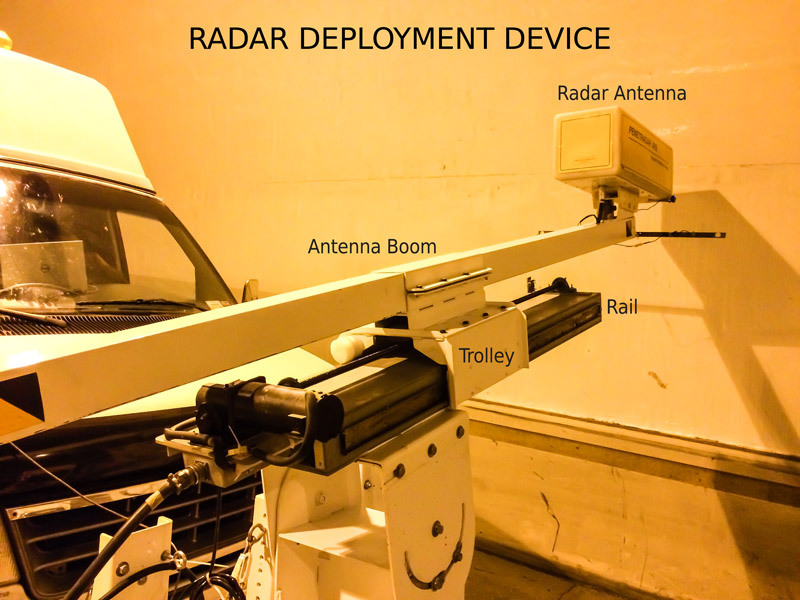 A non-contacting GPR inspection system, featuring a remotely controlled, electromechanical boom places an air-coupled antenna to virtually any “clock” position within 6-12 inches from the liner surface in the tunnel. The results of the nondestructive evaluation of the tunnel lining are both quantitative and graphical. Locations of defects are graphically shown as an “unfolded” 2D plot and quantities are provided in numerical format. The use of NDT technologies can provide a more complete and comprehensive assessment of the current condition of a tunnel liner and help to prioritize repairs. 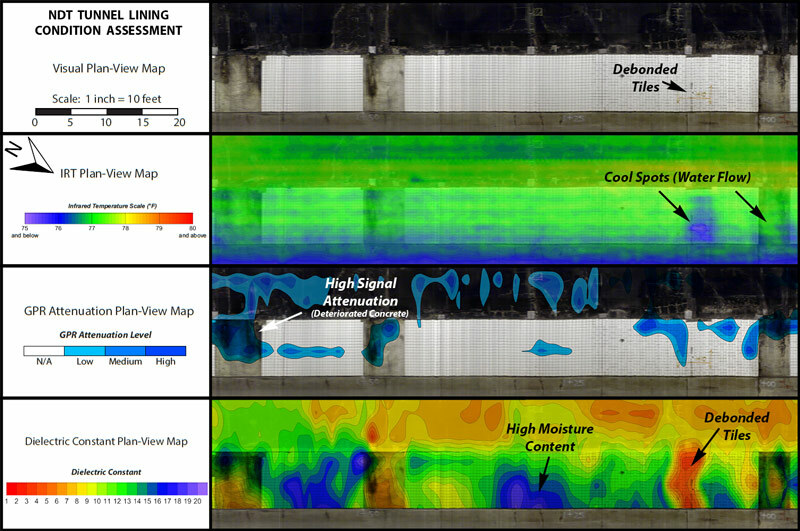 Results of the NDT inspection are shown above in the form of plan-view mappings depicting high resolution (video) images, thermal images, and GPR signal strength (attenuation) and dielectric constant. The methods detect conditions such as water flow behind tiles, deteriorated concrete, water saturated concrete and debonded tiles. 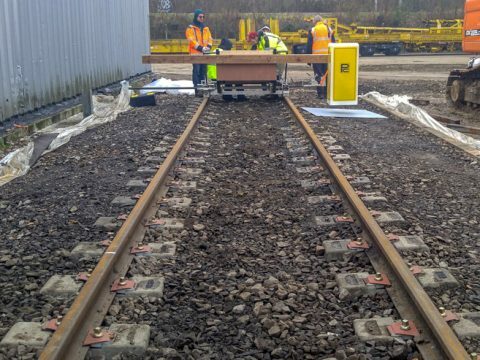 Our results consisted of high resolution images of the liner, infrared thermal images, GPR measurement of attenuation and dielectric constants, and identification of areas of deteriorated liner, voids and moisture intrusion. The combination of these methods provide an effective means of identifying specific areas in need of repair and determining the overall condition of tunnel liners. 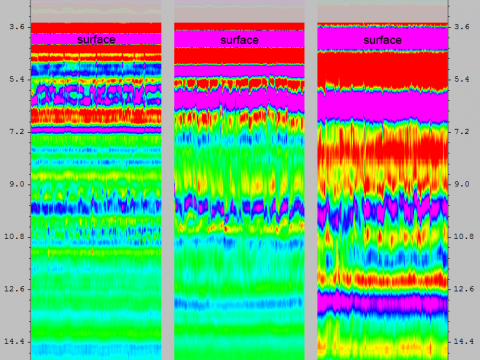 Core samples, soundings and petrographic analysis showed results consistent with the GPR analysis, and when comparing GPR delamination results with ground truth measurements, GPR detected 75% of the known delamination locations and 90% of the sound areas of concrete. 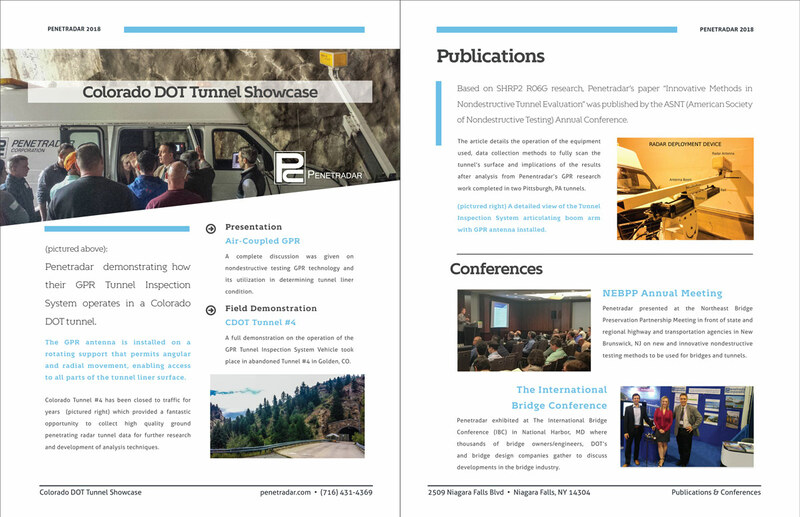 We have participated in multiple SHRP-2 Nondestructive Testing (NDT) for Tunnel Linings (RO6G) Showcases. More information about each of these events can be viewed in the brochures below.